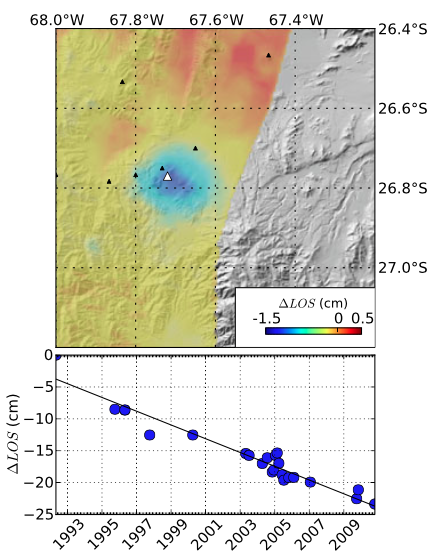 A satellite-based interferometric synthetic aperture radar (InSAR) survey of the remote central Andes volcanic arc (Pritchard and Simons, 2002) revealed deformation in the Robledo caldera between May 1992 and October 2000 (figure 1). Subsidence was detected, with a maximum deformation rate in the radar line-of-sight of 2-2.5 cm/year. The subsidence rate seemed to be decreasing with time. The inferred source depth was 4.5-6 km below sea level. Additional details about the study and analysis are available in Pritchard and Simons (2002). Figure 1. Shaded relief topographic map of the central Andes with insets showing areas of deformation detected by Pritchard and Simons (2002). Interferograms (draped over shaded relief) indicate active deformation; each color cycle corresponds to 5 cm of deformation in the radar line-of-sight (LOS). The LOS direction from ground to spacecraft (black arrow) is inclined 23° from the vertical. Black squares indicate radar frames, and black triangles show potential volcanic edifices. Courtesy of Matthew Pritchard. Reference. Pritchard, M., and Simons, M., 2002, A satellite geodetic survey of large-scale deformation of volcanic centres in the Central Andes: Nature, v. 418, p. 167-170. Information Contacts: Matthew Pritchard and Mark Simons, Division of Geological and Planetary Sciences, California Institute of Technology, Pasadena, CA 91125, USA (URL: http://www.gps.caltech.edu/). The Global Volcanism Program has no Weekly Reports available for Cerro Blanco. The Cerro Blanco volcanic complex contains the 6-km-wide Cerro Blanco caldera (also known as the Robledo caldera) in NW Argentina and is located 80 km SW of the much larger and better known Cerro Galán caldera. Cerro Blanco was the site of the largest known Holocene eruption in the Central Andes about 4200 years BP (Fernandez-Turiel et al., 2013). The rhyolitic eruption produced plinian ashfall deposits of about 110 km3 and widespread ignimbrite deposits. The Holocene Cerro Blanco del Robledo lava dome is located on the southern rim of the caldera and is surrounded by extensive rhyolitic pumice-fall deposits. Satellite geodetic surveys in the central Andes (Pritchard and Simons, 2002) showed subsidence of the caldera in the 1990s. Fernandez-Turiel J, Rodriguez-Gonzalez A, Saavedra J, Perez-Torrado F, Carracedo J, Osterrieth M, Carrizo J, Esteban G, 2013. The largest Holocene eruption of the Central Andes found. Amer Geophys Union Fall meeting, San Francisco, Dec 9-13, 2013, abs V13D-2639. Pritchard M, Simons M, 2002. A satellite geodetic survey of large-scale deformation of volcanic centres in the Central Andes. Nature, 418: 167-170. Deformation at Cerro Blanco. (top) Stack of track 10 interferograms overlain on SRTM hill shade. (bottom) Time series deformation history for a point (?67.72?W, ?27.20?S) in the center of the subsiding zone. Reference List: Pritchard and Simons 2004; Henderson and Pritchard 2013. There is no Emissions History data available for Cerro Blanco. The circular light-colored area in the center of this Thematic Mapper image is the 6-km-wide Robledo caldera. The Cerro Blanco del Robledo rhyolitic lava dome on the southern rim of the caldera was extruded into a pumice cone (pale tones). The margins of pyroclastic flows erupted prior to extrusion of the lava dome are faintly visible on the caldera floor and on the NW flanks of the caldera. 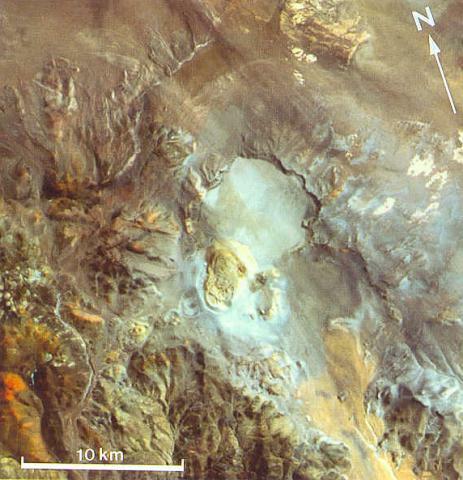 Satellite geodetic surveys in the central Andes showed subsidence of Robledo caldera in the 1990s. Thematic Mapper image (de Silva and Francis, 1991; courtesy of Matthew Pritchard, California Institute of Technology). There are no samples for Cerro Blanco in the Smithsonian's NMNH Department of Mineral Sciences Rock and Ore collection. Large Eruptions of Cerro Blanco Information about large Quaternary eruptions (VEI >= 4) is cataloged in the Large Magnitude Explosive Volcanic Eruptions (LaMEVE) database of the Volcano Global Risk Identification and Analysis Project (VOGRIPA).